Soft rubber grips with thumbrest and finger grooves for a more secure grip on the Ruger Mark II pistol. Available in either Right or Left hand configuration. These are made to fit the Mark III as well as the Mark II and the A08 Framed Mark I's. These feel great and I can definitely hold the gun much better than with the stock grips. I highly recommend them. I had put one of these on my Mark II years ago and was pleased with it. Bought a Mark I with stock grips and was surprised how much I missed these. So off they came from the Mark II and onto the Mark I (use the filler, supplied). Got another set from Rimfire and I am happy, happy again. Very nice grip put it on my Mk1 fits perfect. Received my Hogue grips today for my mk11. fit perfect.feel great. look awesome as well. great product. Ordered the left hand grip for my Mark III. Fit perfectly with no modification required. I have the government 6 7/8 Bull barrel and it made a big difference in the control of the gun. 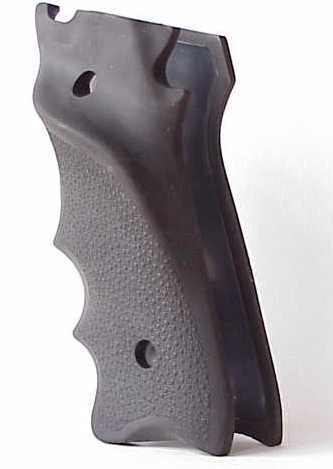 You won't find a better grip for your Ruger for the money. I have had a couple of these on my MKII. Very comfortable. Returned one to factory because it allowed pivot pin to work out (notch was too deep). This is a very comfortable grip. I would advise installing the extended bolt release also.